Made just for your favorite golfer, these quality, personalized men's golf balls come printed with a special message for him next to an image of a golfer in perfect form. From the first tee to the back nine, these custom golf balls make a great gift for golfers of any skill level. One message per pack of six solid core white balls. Specify message; limit 2 lines, up to 12 characters each. These golf balls make a great gift for a golfer. They are fun, and makes it easy to locate your own ball when playing with others. I got these and had them personalized for my father for Fathers Day. They turned out so cute he absolutely loved them.. Could not of asked for a better present for a avid golfer!! Perfect gift for the golfer in your life. This item was a gift. He loved the golf balls with his name on them. my 16 yr old g/son loves playing golf so got these for him. They are a Christmas gift, but they seem very nice. Ordered these as a cute novelty item for Christmas gifts....print is so small, it's barely legible. Totally disappointed so look elsewhere if you want a quality product. Bought 3 sets for gifts for Father's Day. Almost too embarrassed to give them. I picked it for by grandson's 34th Birthday present. Because my son golfs and I thought he'd appreciate them. I chose these personalized golf balls for my son who is constantly doing things for me. He golfs with his buddies and I thought these would be perfect. Trying this for the first time. I will provide feedback after I receive the products. Father's Day gifts. 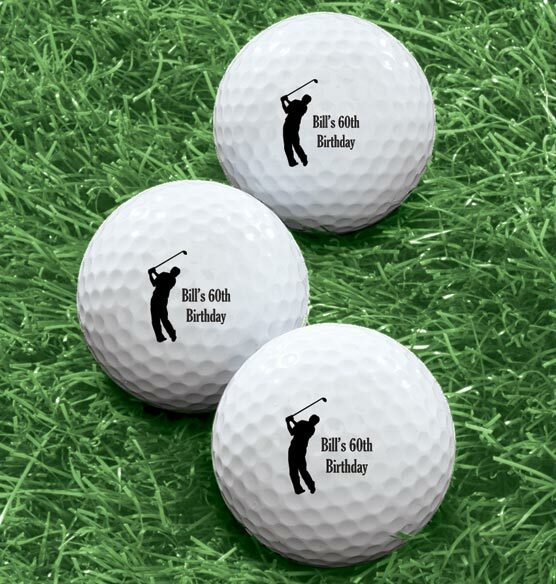 Golf balls were used for favors on tables for a 70th birthday party. I have a brother and a boss celebrating their 60th birthday and they are both golf fans. A MUST HAVE FOR ALL GOLF ENTHUSIASTS. Grandson is an avid golfer and his birthday is doming up. personalized is always THE BEST! and the price was GREAT! My son golfs and it is his birthday. Even at his age, Bill is an avid golfer! BEST ANSWER: Definitely not titleist. My husband uses those also. These are a generic brands that are really just good for the sentiment. My hubby is a golf junkie and even though the gift wasn't the top quality balls he's used to he loved the gift! Thank you for your question. Unfortunately, we are contractually obligated not to provide any manufacture information including brand name. We apologize for any inconvenience this may have caused. They didn't have the brand name on them. Sorry I can't be of more help .